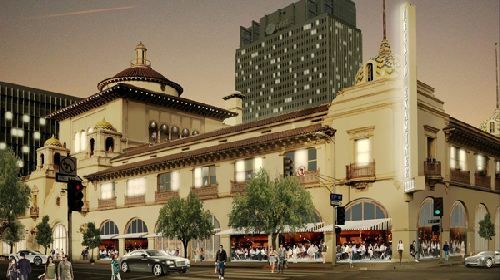 The Georgetown Company has obtained $56.4 mil in bridge financing for the redevelopment and renovation of the Herald Examiner Building, a 100k sf, one-of-a-kind, historic building in Downtown Los Angeles. The loan was arranged by HH and funded through J.P. Morgan. Loan proceeds will be used to fund the renovation and restoration of this iconic property to its former grandeur, which includes redeveloping the existing structure into creative office, retail and restaurant space while maintaining the building’s historic features. Arizona State University is set to open a Downtown Los Angeles campus in the building, while celebrated restaurateurs Walter and Margarita Manzke of République will unveil a new restaurant on the ground floor. Originally completed in 1914, the Herald Examiner building was designed by Julia Morgan, California’s first registered female architect, for William Randolph Hearst to serve as the headquarters for the Los Angeles Examiner. Morgan designed building in the Mission Revival style with an elaborate lobby that included grand, arched spaces lined with carved marble friezes, wood-trussed high ceilings and a patterned tile floor. Located at 1111 South Broadway, the building is in DTLA’s vibrant South Park neighborhood, which houses the Microsoft Theater, STAPLES Center, the Los Angeles Convention Center and the Ace Hotel. An Apple store, the Hoxton Hotel and the Proper Hotel are also currently planned for the neighborhood, which has rapidly become a dining, shopping and cultural hub of the city. The landmark property is now being restored to its original grandeur, the illustrious two-story lobby conjuring up the style and elegance of its past. When completed, the iconic building will offer a mix of restaurants and retail on the first floor with creative office space on the upper floors. The historic building will adjoin South Park with the Broadway Corridor, another rapidly growing and resurgent neighborhood. Widely recognized as one of the most unique and dynamic properties in Downtown Los Angeles, the Herald Examiner building will cement the area as a destination neighborhood. The Herald Examiner Building project is The Georgetown Company’s latest development in the Los Angeles area. The company recently completed a $280 mil multi-phase redevelopment of Sony Pictures Entertainment’s Culver City Studio Lot, creating new office and production facilities, added amenities and improved public spaces. Georgetown also previously developed a theater and office buildings at the Paramount Pictures Studios on Melrose Avenue in a joint venture with Paramount Pictures. HFF’s Todd Sugimoto, Jeff Sause and Spencer Richley arranged the financing.